The Parm 1 kit is one of those kits depicting Russian WWII armour which have been overwhelming us lately. Unfortunately there is not much reference material to check out the correctness of the model but it sure looks good on opening the box. You can see that the contents mainly concern a basic sprue which is ready to receive a lot of additional sets to make different versions of the main truck. Well thought through. There already exists a version of the Parm 2 by the same company. 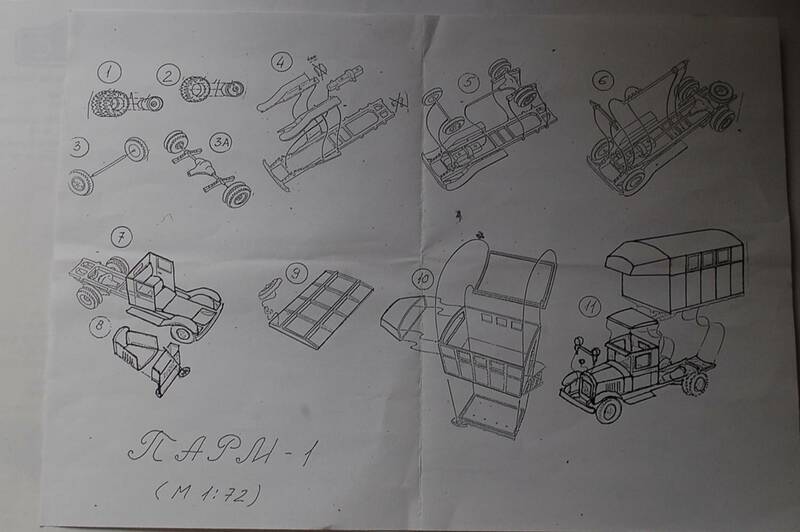 Note that the figure behind "Parm" refers to the amount of rear axles: the Parm 1 had only one rear axle with double wheels and a box-like type of rear compartment with a cabin overhang. You can look at it as a forerunner of the shelters we know now of these days. Wood construction was used to save metal. The construction layout can be called very simple and it all starts with the construction of the axles. I started with the cleaning-up of the tyres and the separate rims. These are highly commended because it allows you to paint tyres and rims in a much cleaner way. The axles are problematic. After being released from the sprue and after cleaning-up, I noticed that none of the 3 metal axles provided in the kit were long enough to be used with either the front or the rear axle. The rear axle also needs to be inserted through the differential gear and through both leaf spring axles before being able to accept both wheel rims. So, the provided metal axles needed to be replaced by other metal parts. It adds strength to the unit but requires some adjusting. The drive shaft between engine and differential was also replaced by a metal one. The exhaust was drilled out. Construction of the main body was simple and very easy. Both rounded fenders only need minor cleaning-up and can’t be misaligned with the chassis. Something to look at by many manufacturers. The cab consists of four separate panels and is very easily put together. The simplicity of it all made me choose to open up the left cab door. A bench seat, steering wheel and dashboard are provided but I opted to add some more detail by adding 3 pedals (recovered pieces of photo-etching) and a map holder (lead from a bottleneck) on the inner side of the left door as well as door handles from a piece of wire. Windows are cut from pieces of clear plastic and window washers are made from a piece of fine copper wire. 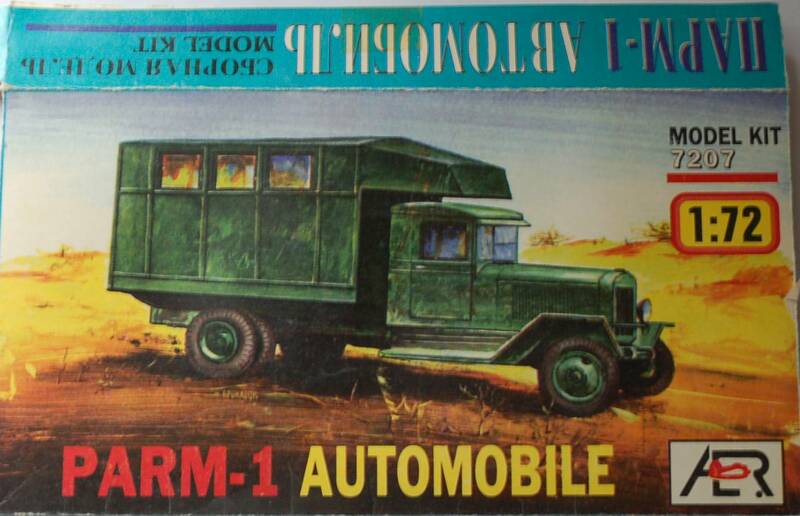 The interior was painted Humbrol 86, best matching with the former Humbrol 114 Russian green. The bench seat is painted brown leather with a wash. The hood consists of four parts and needs adjusting. The radiator was sanded to fit but it came all to a good end. Headlamps are drilled out; get a drop of silver and Kristal Klear to represent the glass. The main body parts form one sprue; you only need to cut off parts, clean them up, glue them together and you are finished. I had no references regarding an interior, so this was omitted but I did fix some windows. The rear door received a door handle. The complete truck was painted Russian green followed by a dry brushing of the green with some white added. All this was followed by a coat of Klir (Future) and Clear Cote over the windows. A nice and somewhat unusual quick build model of a Russian truck (my first one to be honest), simple in concept and easy to build. At the time I was sure it wouldn't be the last one (and it didn’t).